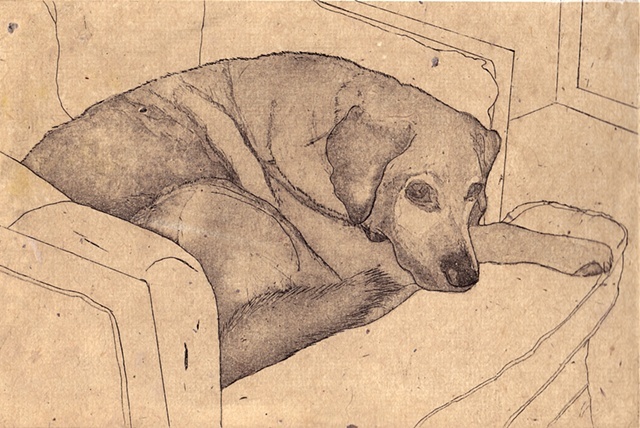 This print features our 14-year-old yellow Labrador retriever Lily, curled up in the living room. As she has aged, we no longer have the heart to chase her out of this comfy chair. The print shown here was printed on a sheet of my own golden handmade gampi paper which was simultaneously adhered to a heavier cotton rag paper; edition of 6. A second edition of 20 was printed on a warm white (Hahnemuhle copperplate) paper.